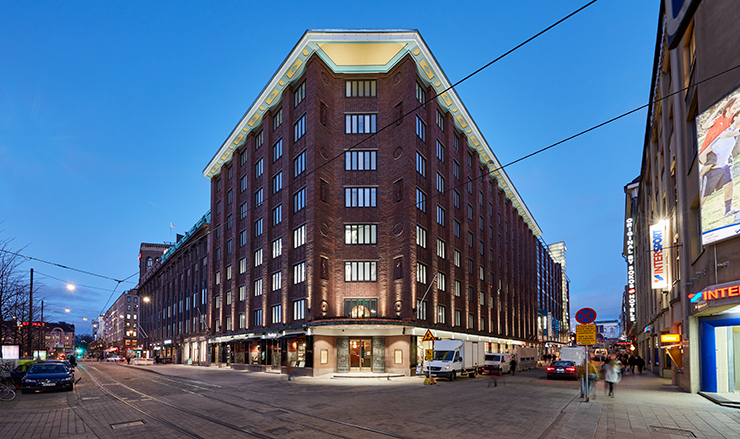 The renovation of the historically significant property of Mikonkatu 9 in Helsinki center has been finished in early 2019. Gullstén-Inkinen Design & Architecture was responsible for the principal and architectural design. The property is owned by insurance company Ilmarinen. The building was designed by Jussi ja Toivo Paatela and built in 1929. The property was originally built as a headquarters for Atlas Bank in 1929, so thorough renovation was due. The red bricks of the facade were mostly in such great condition that not much needed to be done. The interior, however, was outdated both in terms of the office spaces and technical systems. The modern-day tenants expect a lot from premises in the city center, and technology that dates back 20 years simply won’t do. The facade as well as part of the interior is protected under classification SR-1, which means that the building or its structures may not be changed or demolished so that their cultural historical or architectural value is compromised. Any and all renovations are to be negotiated with the museum authority. 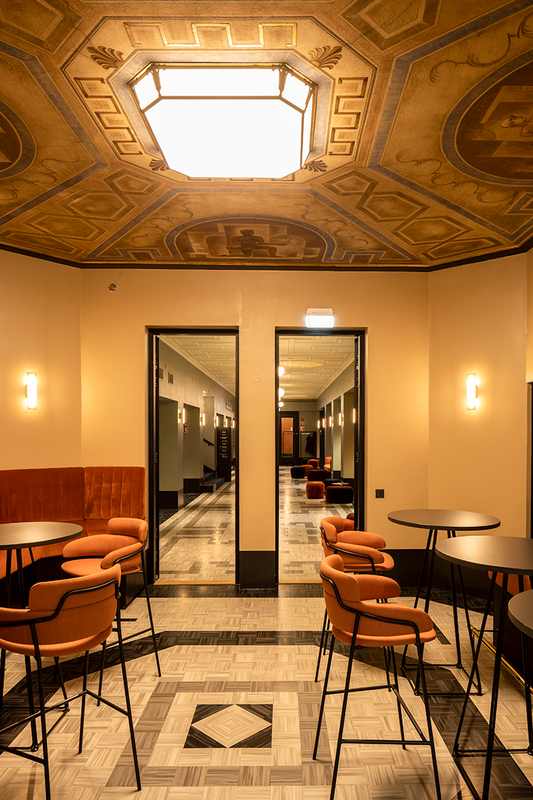 – Together with the specialists from the Helsinki City Museum we found such design and implementation solutions that satisfy the goals of all parties, says Jari Inkinen, architect (SAFA) and interior architect (SIO). Inkinen is the principal and architectural designer of the project. The floor was restored based on old black-and-white photos. The renovation of the property was comprehensive. The interior structures, for example, were in most places stripped down to the concrete in order to avoid any problems with the air quality. On the other hand, auxiliary structures that had been added to the original structures at a later stage, were demolished to create more space. 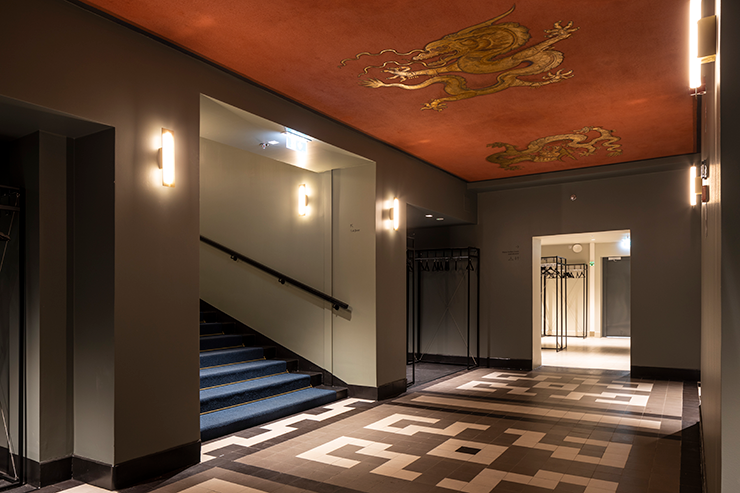 Parts of the street level interiors were also returned to their original glory: the dragons that were painted to protect the banking vaults as well as the floors of the old customer areas were completely restored. 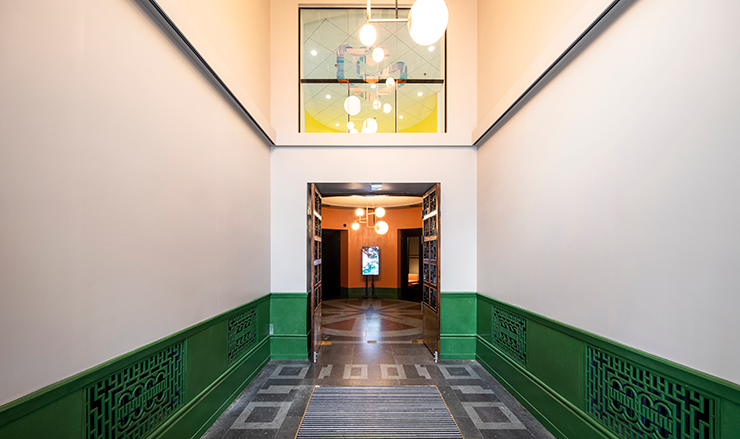 – The pattern on the floors was reconstructed based on old black-and-white photos, Inkinen recounts. The colors were interpreted from small remaining fragments, and the new floor tiles were cut and glued on based on the photos. The glass ceiling of the old courtyard was demolished and was replaced by a new copper roof. The frame of the glass roof was left in place and artificial lights were installed inside the glass to recreate the ambiance of a glass roof. Artificial lighting was installed behind the glass in the roof in order to recreate the ambiance of a glass roof. The dragons, that were originally painted in the roof to protect the banking vaults, were restored during the renovation. 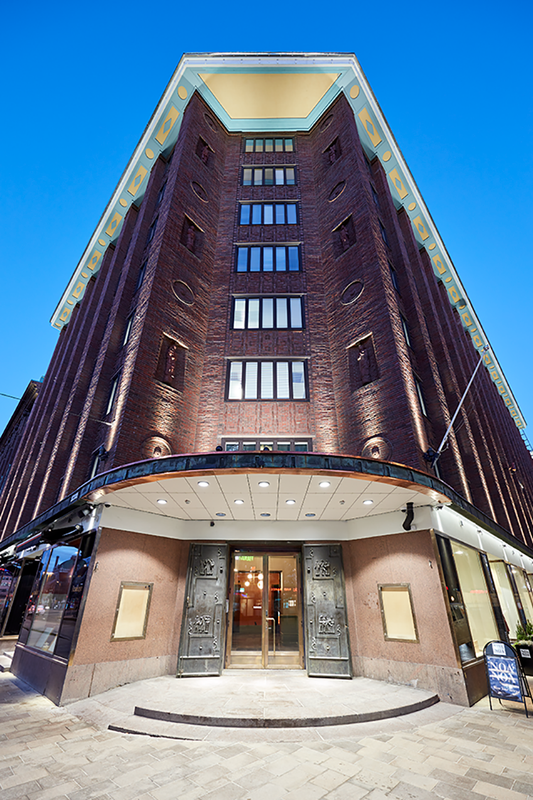 The main tenant of the eight-story-building is Epicenter Helsinki, who has been involved in the renovation project since the beginning. 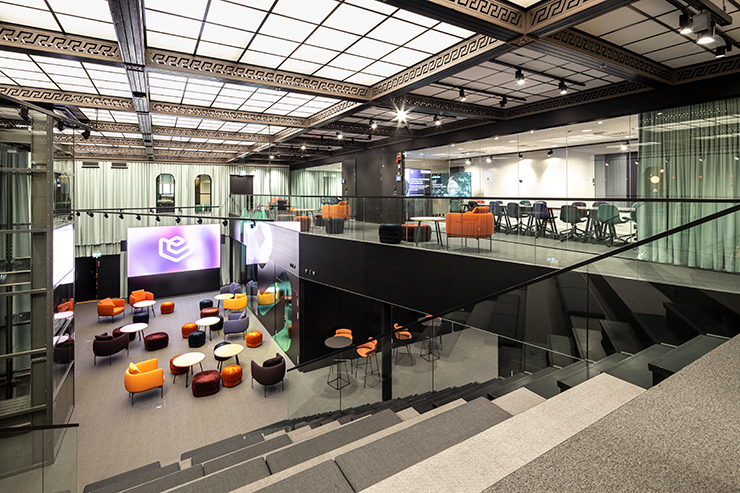 Epicenter provides flexible co-working spaces, innovation laboratories and event management, and the synergies of its subtenants are at the core of their operations. With this in mind, a lot is required from the design of the office space in the building: they need to be able to accommodate different sizes of companies in different stages of their life cycle. There were also comprehensive changes in the common areas in the first and second floors of the building. A loft structure was built in the old banking hall, so that smaller spaces could be added on the second floor. 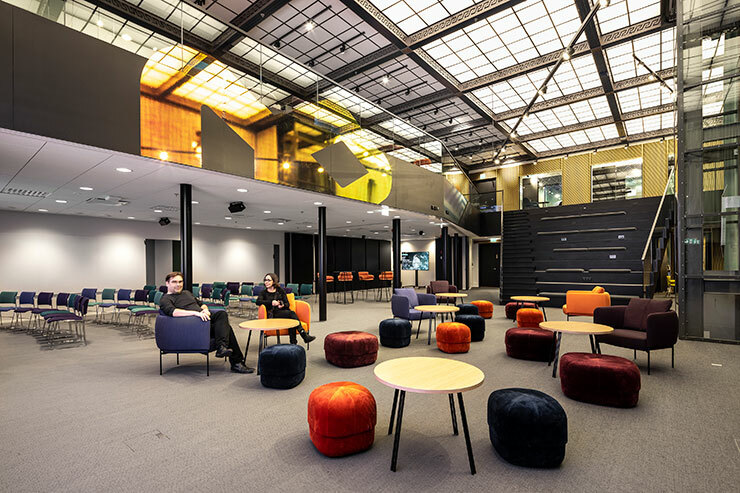 By moving the transferable walls, the lower levels can be arranged into a two-storied auditorium for 200 people. An auditorium for 200 people can be achieved by moving the transferable walls. With the mobility of the employees in mind, a new stairway was added in the middle of the building, in addition to the two existing ones. This made the distribution of space more flexible in the upper floors – the offices in each floor can be rented out to five tenants instead of two. The commuters with bicycles were also taken into consideration by building washing facilities and bicycle parking, complete with a bicycle elevator, on the basement level. The original ceilings of the building are absolutely beautiful. An auxiliary roof structure was demolished from the hallway to create the sense of light and space. 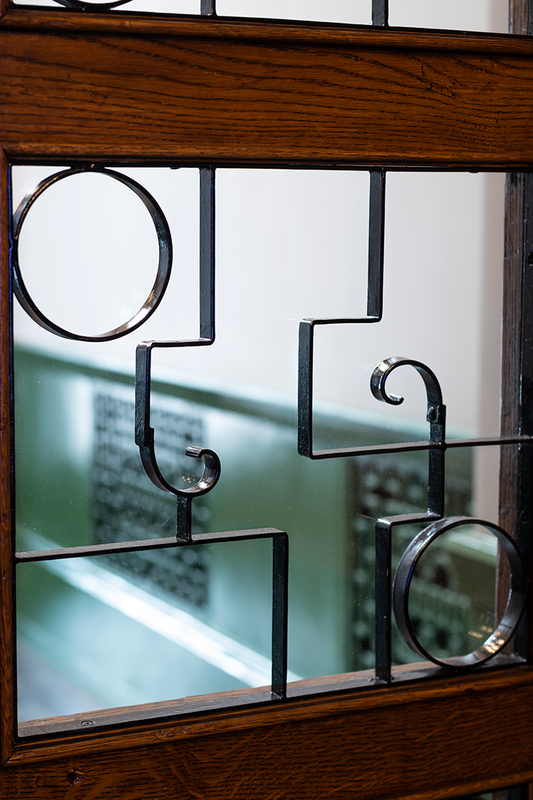 This beautiful detail is from one of the doors. The red bricks of the facade were so well-preserved that not much needed to be done with them. Gullstén-Inkinen Design & Architecture is a creative design agency with experience and vision. We design solutions that have a small carbon footprint and a big heart. Our team consists of architects, interior architects, graphic designers, workplace consultants, service designers and project engineers. 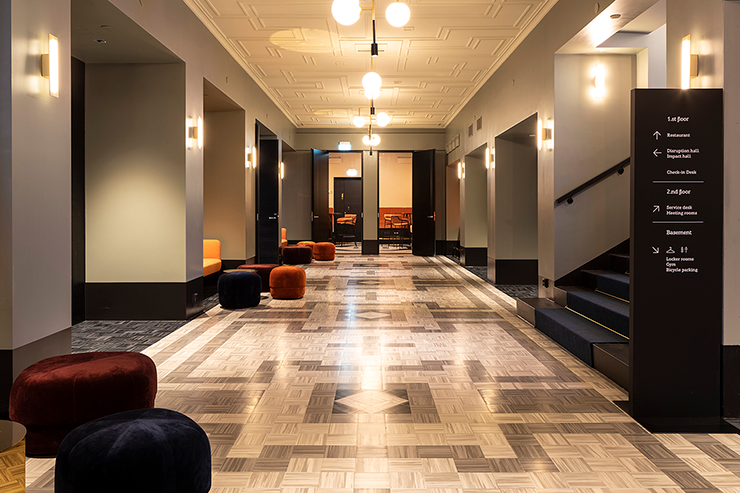 Our design projects cover adaptive reuse of buildings, working environments, commercial facilities, showrooms, restaurants, hotels and learning environments.